Each year, admirers purchase more than 75 million poinsettias during the six-week holiday season between Thanksgiving and New Years. After seeing these brilliant red, pink, white and dappled poinsettias everywhere, have you every wondered how many of the lush tropical “Mexican fire plants” survive the winter months? Not many – based on my experience. Poinsettias in my hands usually became dreadful-looking and leafless by February. But for some reason, a beautiful white poinsettia I received as gift in 2011 not only survived the year, it quadrupled in size and is developing blooms just in time for this holiday season! Since I didn’t know what I did to make my poinsettia flourish, I decided to do a little research. I discovered more than 60 varieties exist and was shocked to learn poinsettias grow to ten feet in height in their natural tropical habitat in Mexico! Botanist Dr. Joel Poinsett, America’s first ambassador to Mexico in 1825, introduced this unusual plant to our market. National Geographic News says the poinsettia is now the top-selling potted flowering in the US. Cultivated by Aztecs, the brilliant flower was a symbol of purity. In the 17th Century, a group of Franciscan priests near Taxco began using the blooms in a nativity celebration. But, it isn’t only during the holidays you can enjoy this perennial plant. With the right care they will thrive for years. Poinsettias do best in natural light in 65 degree daytime temperatures away from drafts and cold windows. Depending on your residence, these plants do well outside if the proper location is chosen. In Montana, it is safer to maintain them as house plants. The second and very important care is watering—just enough, avoiding over-watering. It must be in a draining pot and watered when the soil is dry to the touch. Discard excess water. Continue above care through March. In April, trim back the main stems to about 8 inches. When new growth appears along the stems, fertilize once a week. Water as directed. In mid-July, snip tops leaving at least 4 leaves on each stem to encourage it to branch and become bushy, creating lots of blooms. In the fall, beginning October 1 and extending until Thanksgiving, the plant prefers 14 hours of complete darkness from 6 pm to 8 am. The darkness can be simply provided by covering the plant with a box or by placing it in a closet. 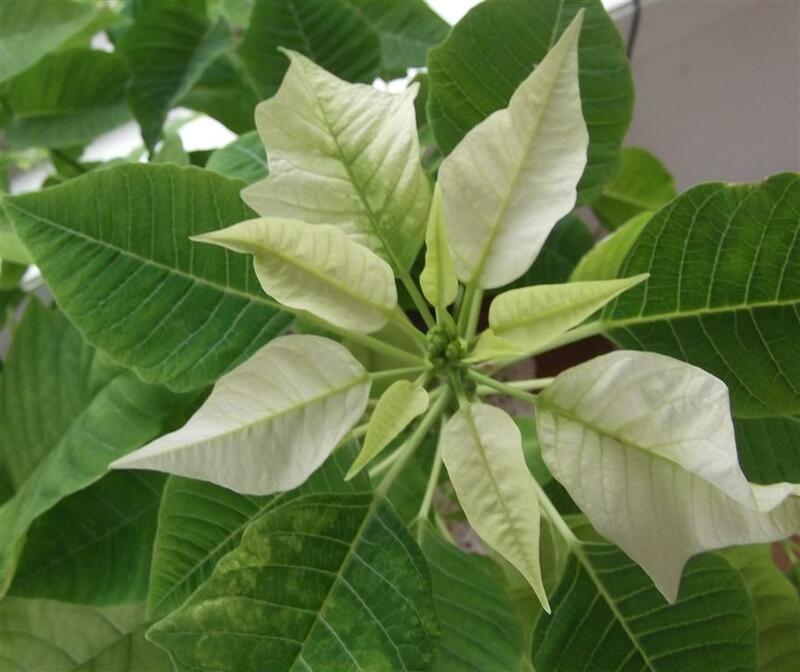 Once the dark treatment is complete, the color-changing leaves (bracts) begin to change to showy colors. Stop the fertilizing, but continue watering when needed. Place the plant in an area that receives natural light away from drafts. My poinsettia survived through luck —and by careful watering, a little fertilizer and letting it live in the northeast corner of a sunny room. Instead of placing it in complete darkness, the natural shortening hours of daylight in the northern Montana winter has been adequate to trigger the bracts to change color. After this blooming period, I plan to snip off a few of the longer stems to encourage more leaf growth. Best of luck in your efforts to care for your poinsettia and watch it re-bloom in 2013.